Baked. Mashed. Scalloped. Stuffed. Sautéed. Topped with the works. Potatoes are always destined to taste spectacular no matter how they’re prepared. What’s your favorite version? With so many options, making plans for a basic bag of yellow taters may be harder than it looks. 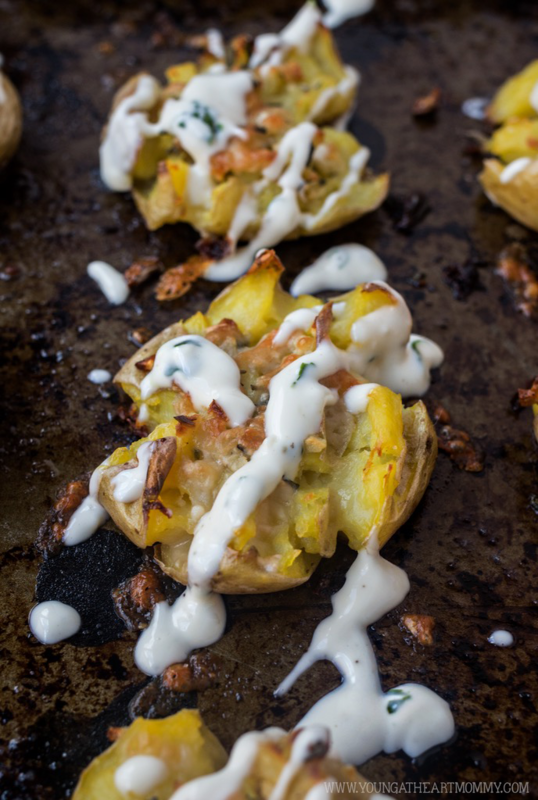 As someone who thoroughly enjoys her carbs, to the last bite, I was excited to finally make these crispy Garlic Parmesan Smashed Potatoes. They’ve been on my mind for weeks after trying a similar version using sweet potatoes and brown sugar. While I love the combination of sweet and salty, sometimes savory is the way to go and that’s especially true with this recipe. 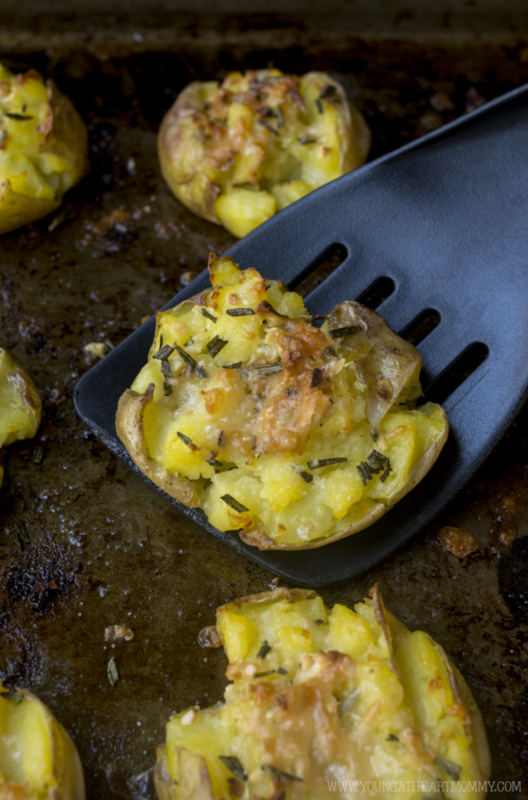 Seasoned with fresh garlic and rosemary, Crispy Garlic Parmesan Smashed Potatoes may be flat but there’s nothing bland about them. I’ve even added a light and creamy lemon aioli drizzle to tie all of the flavors together. Absolutely delicious. I wouldn’t be surprised if these are devoured immediately! Add unpeeled potatoes to a large pot of lightly salted water. Potatoes should not be completely submerged but covered by at least an inch or two of water. Increase heat and bring to a boil. Cover and reduce heat while potatoes cook for 12-15 minutes, or until tender. Test by piercing them carefully with a fork. Drain excess water. 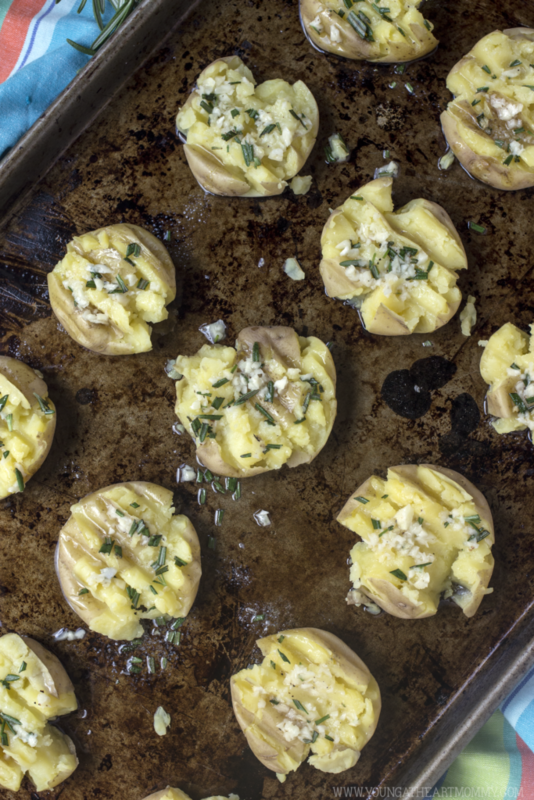 Prepare baking sheet with a generous drizzle of olive oil or cooking spray. Line potatoes up while arranging them in rows so they have room to spread out once smashed. 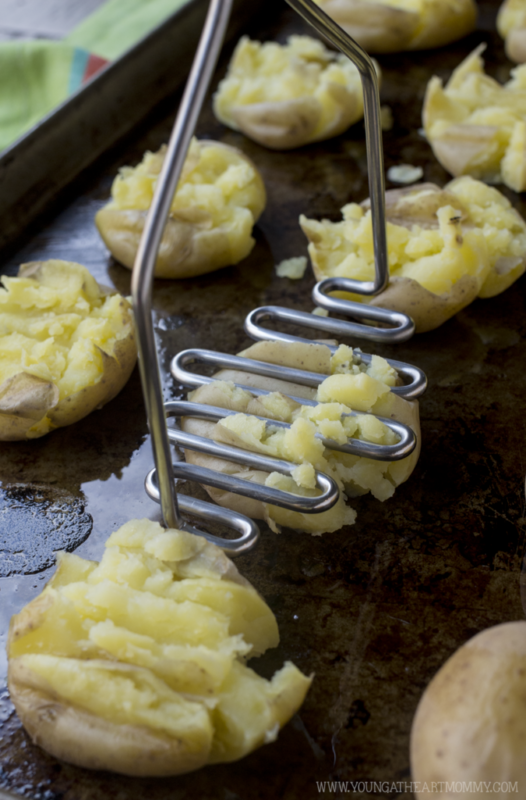 Gently flatten potatoes using a metal potato masher tool. Push down slightly, enough for the potatoes to expand but not so much that they break apart. Mix together melted butter, 3 cloves of minced garlic, and rosemary. Lightly brush the tops with olive oil, focusing on the skin. Use a spoon to add melted butter mixture to each potato. Sprinkle on salt and pepper. Bake for 15 minutes or until edges are golden brown. Add Parmesan cheese to each. Broil for an additional 2-3 minutes for extra crunch but be careful not to burn. Remove and allow to cool. Mix together mayo, lemon juice, zest, 3 cloves of minced garlic, salt and pepper to taste. Chill in the refrigerator for 15-20 minutes. Drizzle on top of smashed potatoes. Eating and entertaining is practically inevitable this time of year. A plate of these tasty ‘tatoes will be the star of your next summer shindig. Everyone loves a good side to pair with their hamburger or hot dog. Smash, smother with seasonings, and serve! Then wait for the smiles. 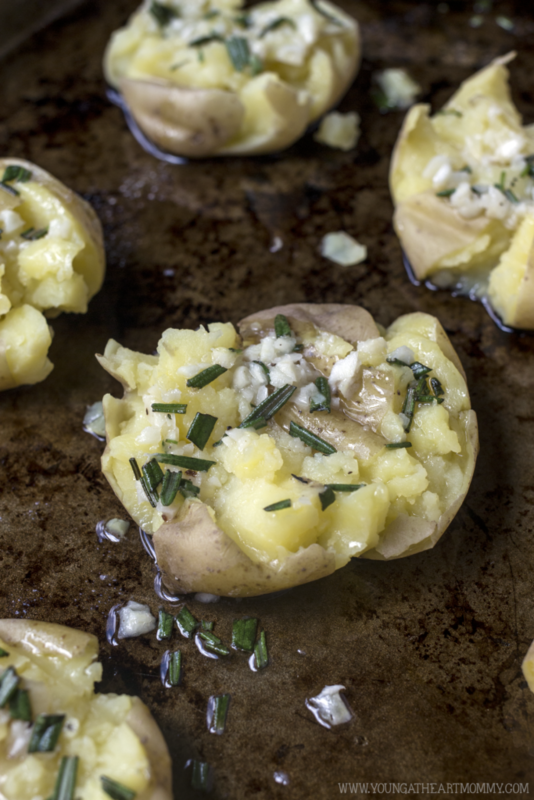 For a crisper outer shell, you can toss the potatoes on the grill instead of baking. 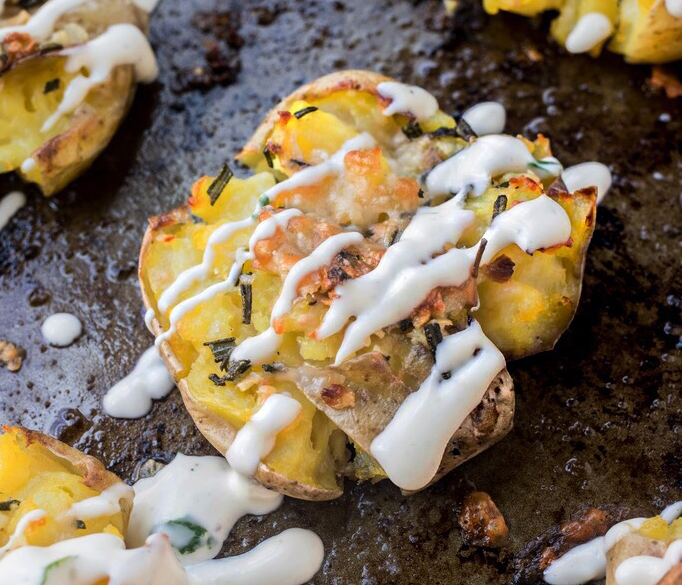 There’s nothing better than slightly charred potato skins and the fragrant aroma of rosemary heating above a fire. If you’re already swooning over these smashed potatoes then check out this recipe for Sweet & Spicy Candied Onion Rings! It’s still one of my all-time favorites and great for gatherings. 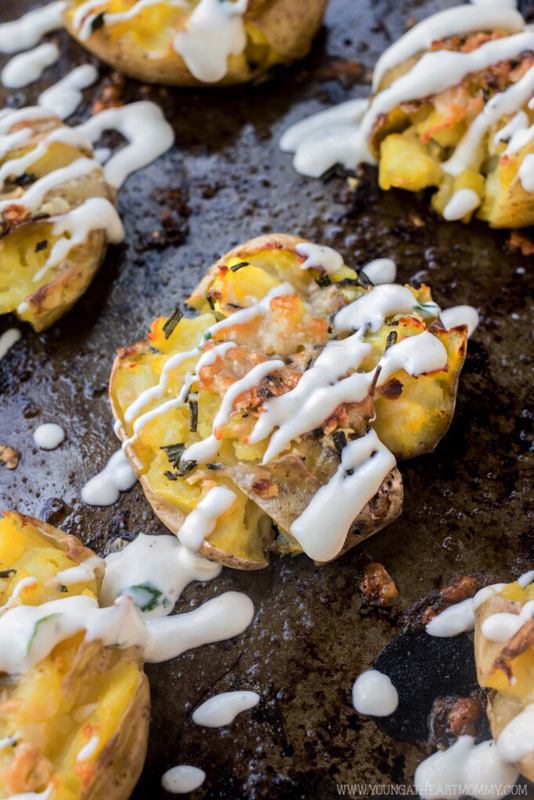 I want to make these Smashed Potatoes. My family would love it and it looks so delicious! Thanks for sharing.